Saturday Night Live and Last Man On Earth writer Emily Spivey is working on an upcoming animated series for Fox that features Phil Lord and Chris Miller as executive producers and Kristen Wiig, Maya Rudolphs, Jillian Bell, and Ike Barinholtz as the primary voice actors, but today at a Television Critics Association event she dropped an even more exciting reveal: The series, Bless The Harts, technically takes place in the King Of The Hill universe. Harts is a comedy about a poor family living in North Carolina, and Spivey says that the family happens to do their shopping at Mega Lo Mart, the oppressive retail chain that the Hills begrudgingly shopped at (or, at least in one episode, nearly exploded at) on the older Fox show. Spivey even asked King Of The Hill creator Mike Judge for permission to use Mega Lo Mart in Bless The Harts, saying “he was so sweet” and he agreed to it. She says she really felt like the two shows should exist “in the same world,” so even though they’re not technically related at all (beyond the fact that they’re both on Fox), we can imagine the Hills doing their thing down in Texas while the Harts do their thing in North Carolina. 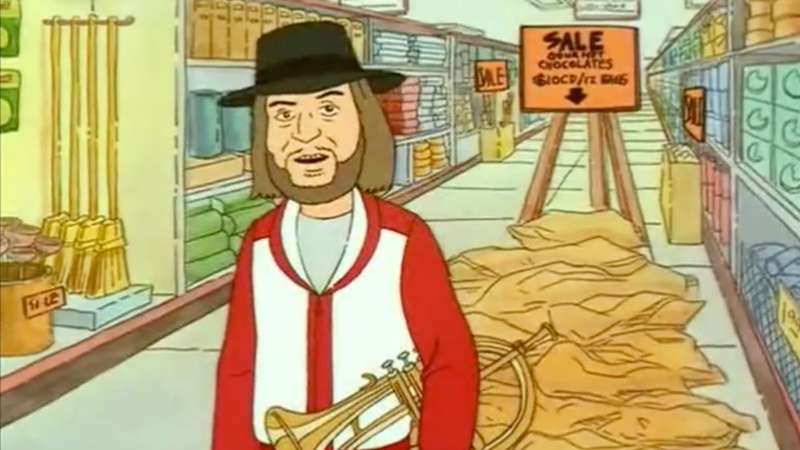 This all comes from /Film, which has some more details on the characters of Bless The Harts and a promise from Lord that the animation won’t feel “machined,” but all we want to do now is check in on iconic Mega Lo spokesman Chuck Mangione.